The booking is now closed. You can be on the waiting list from our Eventbrite ticketing page. You can find us on Facebook here, and on Twitter here. If you want to tweet about or follow the conversation about the conference, look out for the hashtag #IconAE15. This conference has been made possible by the generous contributions of our sponsors. We look forward to welcoming you in April 2015. We are pleased to announce a special panel discussion session between Dr Vincent Daniels and conservators from the British Museum’s Hirayama Studio, to take place in the last slot of Session 2 at 16.30 – 17.00. The discussion will focus upon different methods of paste and paste-making in Eastern and Western studios, but we would also like to invite attendees to submit their questions on all matters relating to paste. How do we discuss different paste qualities, or quantify how thin a paste used for lining should be? Is wheat starch paste truly reversible? How much does cooking time, or vigorousness of stirring affect the end result? Are there other starches we could be using more in conservation? Please submit your question below, or topic that you would like to hear discussed! A number of centres for conservation – including museums, archives, large collections, a library, a research facility, and a private studio – have kindly agreed to open their doors to Icon’s conference delegates to provide studio tours. These are included in the price of your conference ticket but spaces are limited so booking is required. All tours will take place on 8 April 2015. If booking on both morning and afternoon tours, please note that you will need to arrange your own travel between locations and please ensure that your selections allow enough time for this. You can book for your preferred tours when you purchase your conference ticket on our Eventbrite ticket page. 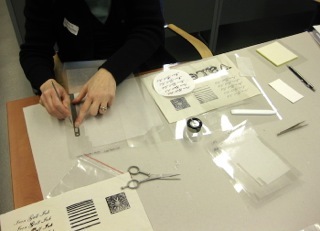 The British Library: The British Library conservators’ multifaceted role includes preparing objects for loans and exhibitions, conducting large-scale digitisation projects, and making running repairs to books constantly in use. The tour will include a visit to the Centre for Conservation, including a look at analytical equipment such as that used for multi-spectral imaging, and a presentation of the conservation department’s ‘fit for purpose’ approach. The British Museum: The British Museum is pleased to offer a tour of its specialist Hirayama Asian Pictorial Art Conservation Studio and newly built, state-of-the-art conservation facilities located in the World Conservation and Exhibition Centre (WCEC). The WCEC is adjacent to the British Museum’s existing architecture and houses purpose-built conservation studios and science laboratories, a storage area, exhibition gallery, and a collection hub. UCL Institute for Sustainable Heritage: UCL Institute for Sustainable Heritage is pleased to welcome you to its heritage science laboratory to present the interdisciplinary research in heritage science and sustainable management at the Institute. The projects range from scientific studies of historic paper, including Islamic and Asian paper and understanding of the smell of paper, to non-destructive characterisation and material condition assessment of library materials. Of particular interest may be research into evidence-based environmental management in libraries and archives, and research into understanding of visitor attitudes to degradation and loss. The visit will include hands-on demonstrations of scientific research tools, both those useful in daily examination of objects, to more advanced documentation tools such as hyperspectral imaging. John Jones: John Jones arts consultancy is a global leader in the preservation and presentation of fine art, providing various expert services to support artists and collectors in addition to its core business of bespoke framing. Delegates will be shown around the new Arts Building at the Finsbury Park site, a purpose-built, six-floor building. The tour will include the conservation studio, photography studio, artwork storage and loading areas, mounting and fitting departments, and client consultation area. For more information, please visit their website. London Metropolitan Archives: London Metropolitan Archives (LMA) holds around 105 kilometres of records related to 1,000 years of the history of London. This massive collection keeps growing to reflect London’s ongoing history through new acquisitions. The tour will cover the role of the LMA conservation team, taking visitors through the conservation studio, the box making studio, and one strong room. Museum of London: Rose Briskman and Clare Reynolds will be delighted to show delegates round the Paper Conservation Section of the Conservation and Collection Care department of the Museum of London, and will discuss their work on exhibitions, loans, and stored objects. They will talk about pest management, and the use of trained volunteers in improving storage. There will be plenty of opportunity for discussion of all the usual concerns of the paper conservator, and visitors’ opinions will be welcomed. The National Archives: The National Archives is the UK government’s official archive, storing over 1,000 years of public records, from the Domesday Book to digital files, and making them accessible to all. A visit to the Collection Care Department will illustrate the broad range of activities we undertake to prolong the life and enhance the value of this vast collection, via a studio visit and repository tour. Parliamentary Archives: The Parliamentary Archives at the Houses of Parliament has custody of several million records of historical, constitutional, and political significance, and the Collection Care team is responsible for managing the conservation and preservation needs of the Archives and also assists other offices at Parliament. The tour will include a visit to the Original Act room in the Victoria Tower and the Collection Care studios. Please note, all visitors to the Parliamentary Archives must be carrying photo ID, be prepared to go through a security check, and be able to walk up and down stairs unaided and use a lift. Royal Botanic Gardens, Kew: Royal Botanic Gardens, Kew invites you to visit its Paper Conservation Studio and Economic Botany Collection to look at some remarkable items from East Asia. During the tour, both conserved and untreated botanic illustrations will be on show, including a collection of Chinese export paintings on pith paper. A unique collection of historic and modern Japanese papers will also be presented. The V&A: The V&A Conservation Department combines the expertise of conservation scientists with the skills and knowledge of a multidisciplinary team of conservators. The tour will include a visit to the book, paper, and painting conservation studios, where you will be able to see and discuss work on upcoming exhibitions and displays. The Wellcome Collection: The Wellcome Collection explores the connection between science, art, and history through a dynamic program of public display. The Wellcome Library holds unique resources on the history and progress of medicine. The conservation team is pleased to offer a tour of the conservation facilities and present its role in caring for this exceptional collection. Visitors will also tour the Reading Room and the exhibition galleries. We will provide abstracts and speaker profiles in due course, but in the meantime we are very excited to announce our programme of talks. Tickets can be purchased here and information on the in-conference workshops running concurrently with the main programme of talks can be found here. As well as the conference talks in the main lecture theatre, we have a number of smaller, more practical sessions running in the breakout rooms throughout the day. These are all included in the price of your conference ticket, but spaces are limited so you will need to book. To ensure that everyone has a chance to benefit from the expertise of our demonstrators, we ask that in the first instance, each delegate books places on no more than two workshops. If there are places left nearer the time of the conference, we will open this up further. You can book your places when you purchase your conference ticket via our Eventbrite ticketing page. Hidaka Washi from Kochi, Japan, produces the world thinnest machine-made Tengu paper. Satoshi Hasegawa from Gifu, the home of Mino paper, has been producing one of the best quality Japanese papers desired by Japanese conservators. This session will comprise an illustrated talk on differences in machine-made and hand-made papers, their properties, and their usage. 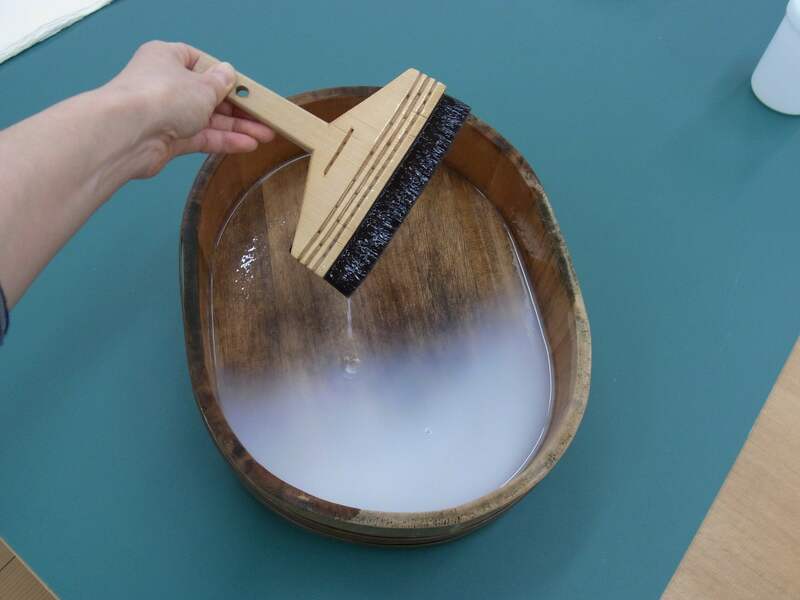 Kobayashi Hake produces a variety of hand-made hake brushes in a traditional manner. Their brushes have been widely used for Hyogu for a long time. Mr Tanaka will give an illustrated talk on a variety of hake produced in the Kobayashi Hake workshop, their history and usage, and most importantly how to look after your hake. There will be panel presentation at their trade stand, and a Q&A session if time allows. Namiko Tagawa from Japan, who is trained in both traditional Japanese conservation and Western book and paper conservation, will discuss the Karibari board in this session. She will talk about its structure, its manufacture, how and what it is used for, and how to maintain your Karibari board to keep it in good condition for repeat use. A video on Karibari board-making, produced at the Folger Shakespeare Library, will also be shown during the talk. Please note, the content of this talk will be repeated in Ms Tagawa’s post-conference workshop, so participants on that three-day course are requested not to book for the in-conference workshop. Simon Fleury from the V&A will hold a workshop on Japanese paulownia woodbox making. Simon will show some slides from his research trip to Japan, some boxes he produced, and the woodworking tools he used. He will also demonstrate the use of these tools. This will be a small workshop for up to 15 attendants, involving free discussion with Simon. Megumi Mizumura is conservator of Western art on paper at the British Museum, with over 19 years’ experience in Western and Asian paper conservation. Nancy Jacobi is the President of the Japanese Paper Place in Canada, with 35 years’ experience as a Japanese paper supplier. In this workshop, a brief comparison of Chinese, Korean, and Japanese papermaking and materials will be given. Participants will examine various paper samples to determine their differences in quality for various conservation purposes¬. There will be a discussion of the usage of various papers in conservation, stressing the importance of selecting papers with the desired properties (strength, malleability, translucence, longevity etc. ), and also on the variations that can result from using different sources of raw materials and different preparation methods. The group will be encouraged to share their experiences and ask any questions they have that are particular to their needs. The participants will hopefully end the session with a better idea of what affects the quality and availability of Japanese papers currently made for the conservation and fine art markets. If you wish to attend this workshop, you are requested to also attend Megumi Mizumura’s talk on Japanese paper in the main lecture theatre earlier in the programme. This session follows Susan Catcher’s talk in the main lecture hall. Susan has a background in paper conservation and works at the V&A Museum on the East Asian Collection. Susan has researched into natural, locally cultivated dyes, and experimented in changing their colours by using different mordants. Her research was inspired by Korean artist Kwang-Young Chun, who uses traditional materials and methods of dying for his artwork, which is being exhibited at the V&A. This session offers a chance for informal Q&A and discussion related to their research. There will also be an opportunity to see some dye materials and Susan’s experimental specimens. **Update** Due to unforeseen circumstances Kwang-Young Chun will no longer be able to join us in London for the conference. However Susan Catcher has very kindly agreed to run this workshop solo so it will still go ahead. In the days following the conference, we are delighted to be hosting an exciting range of additional workshops as a part of Adapt & Evolve 2015. The workshops are led by international experts and will provide you with specialist knowledge and training that you can apply to your own practice. The workshops are brought to you at a subsidised cost by the generosity of the Clare Hampson Fund and as such are only open to delegates attending the conference. Workshop places can be booked and paid for on our Eventbrite page when purchasing your conference ticket. Numbers are limited so we urge you to book now to avoid disappointment. Description: Starch paste has long been used as a material for art and conservation in Japan and Japanese conservators have developed sophisticated skills related to its use. The aim of this workshop is to introduce Japanese techniques, practical methods, and the underpinning chemistry. Funori and other Japanese conservation materials will also be discussed. 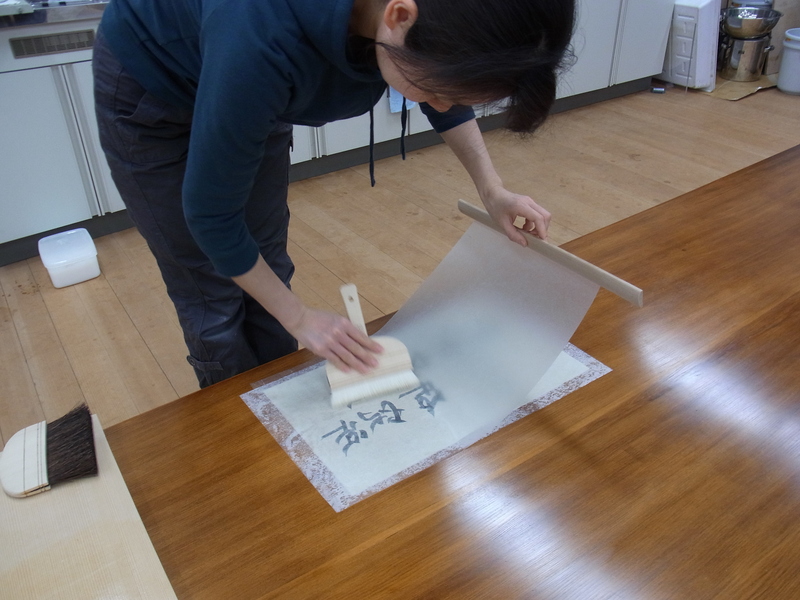 Ms Hayakawa has given this workshop for ten years at the annual ICCROM International course on Conservation of Japanese Paper, held in Japan. She has also led similar workshops in Germany and Italy. This is the first time the workshop will be held in London. Course leaders: Eliza Jacobi, Paper Conservator working at RNA (Restauratie Nijhoff Asser), graduated from Instituut Collectie Nederland (RCE); and Claire Phan Tan Luu, Freelance Paper Conservator working in Amsterdam, graduated from Panthéon-Sorbonne University. Description: Historic manuscripts and drawings made with iron gall ink on paper often contain weak areas and cracks caused by local corrosive action of the ink. Ultimately, this can lead to losses of valuable fragments. In such situations, paper conservators have to select and implement appropriate local repair techniques. They need to address the practical question of how to provide adequate mechanical support to the paper while minimizing the risk of migration of iron (II) ions. Eliza Jacobi and Claire Phan Tan Luu explain the interactions between iron gall ink, water, and paper, and the chemical mechanisms at play during iron gall ink degradation. They propose and demonstrate a specific repair technique with the combined use of the ‘Dutch Fe-migration mending test’ and remoistenable tissue. In the workshop, participants will get to prepare their own remoistenable tissue with different Japanese papers and adhesives, and practise local repairs on iron gall ink using the Dutch Fe-migration mending test. 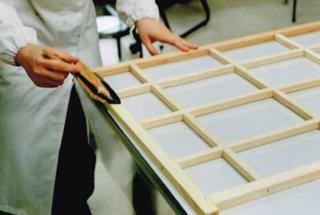 Course leader: Ms Namiko Tagawa, course leader from Japan, is trained in both Japanese and Western paper conservation. Description: Japanese drying boards, Karibari, are used in paper conservation to slowly dry paper whilst preventing dimensional changes. During this practical workshop, Ms Tagawa will lead participants through the construction of a Karibari board and teach them how to use and maintain it in day-to-day conservation practice. Each participant will make and take home a 60 x 90 cm Karibari board constructed with five layers of paper. Please note that during the course of this workshop, Ms Tagawa will repeat the content of her in-conference workshop talk, so participants are requested not to attend both. Course leaders: Mr Kwang-Young Chun, Contemporary Artist; and Been Kim, Designer with Chun Ho Kim, Master Craftsman. Description: This two-session workshop showcases the use of hanji, the traditional Korean mulberry paper, in contemporary Korean art and design practices. In the first session, the artist Chun Kwang-Young will demonstrate the preparation of specific traditional, organic dyes, and their application on hanji, following a practice that goes back centuries. He will also show how he uses these techniques in his creative artwork series Aggregation, one piece of which can be seen in the Korean gallery at the V&A. Due to unforeseen circumstances Mr Kwang-Young Chun will sadly no longer be able to join us in London. To replace this session, Susan Catcher has very kindly agreed to step in and repeat the workshop she is holding during the conference on the Research and Practical Uses of Natural Dyes. Susan has a background in paper conservation and works at the V&A Museum on the East Asian Collection. Susan has researched into natural, locally cultivated dyes, and experimented in changing their colours by using different mordants. 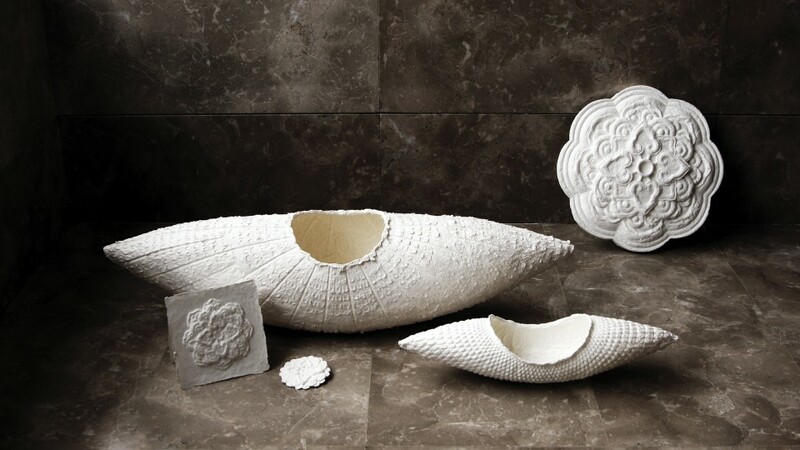 Her research was inspired by Korean artist Kwang-Young Chun, who uses traditional materials and methods of dying for his artwork, which is being exhibited at the V&A. This session offers a chance for informal Q&A and discussion related to their research. There will also be an opportunity to see some dye materials and Susan’s experimental specimens. In the second session, the designer Been Kim will present her design praxis, which highlights the versatility of the humble hanji paper. She talks of her long period of collaboration with a paper master craftsman, Chun Ho Kim, and of her proposal for an alternative to leather goods in upcycling scraps of Jangpanji (the oiled laminate paper flooring used in traditional Korean houses) into desirable design products. Delegates are welcome to attend both sessions. The conference will be divided into two themes, which are briefly outlined below. You are encouraged to base the content of your paper on one of these themes. Adapt & Evolve: papers which explore the introduction, formalisation and evolution of East Asian materials and techniques in the conservation of Western book and paper collections. Materials & Techniques: submissions on the latest research into materials and techniques borrowed from Japan, China, Taiwan and Korea. Abstracts are invited on all aspects of conservation relevant to these themes, including scientific studies and PhD research. Proposals for practical workshop sessions are also welcomed. Abstracts should be in English and 300–500 words in length. Please also include the title of the presentation, name(s) of the author(s), mailing address, telephone number, and name and email address of the presenter. Participation from students, new Icon members and professionals in allied fields is encouraged. The deadline for abstracts is 30 June 2014. A selection committee will review abstracts and notify speakers no later than 30 September 2014. This will be updated with more information about the conference and the themes as it becomes available, as well as abstracts from key speakers. A call for posters will follow in June 2014. This conference aims to explore the introduction, formalisation and evolution of East Asian materials and techniques that have become part of paper conservation practice across the globe. During the conference, speakers and delegates will look into how these practices, materials and techniques have been adapted and developed within the conservation of Western book and paper collections. The conference will draw together key speakers from across the international conservation community, providing delegates with a fresh view of current research into materials and techniques borrowed from Japan, China, Taiwan and Korea. The conference will provide opportunities for delegates to take part in practical workshops and will feature a wide variety of trade stalls, including papermakers from East Asia. The two-day conference will be proceeded by a day of studio visits where delegates will have an opportunity for to book into pre-arranged tours of conservation studios in London. 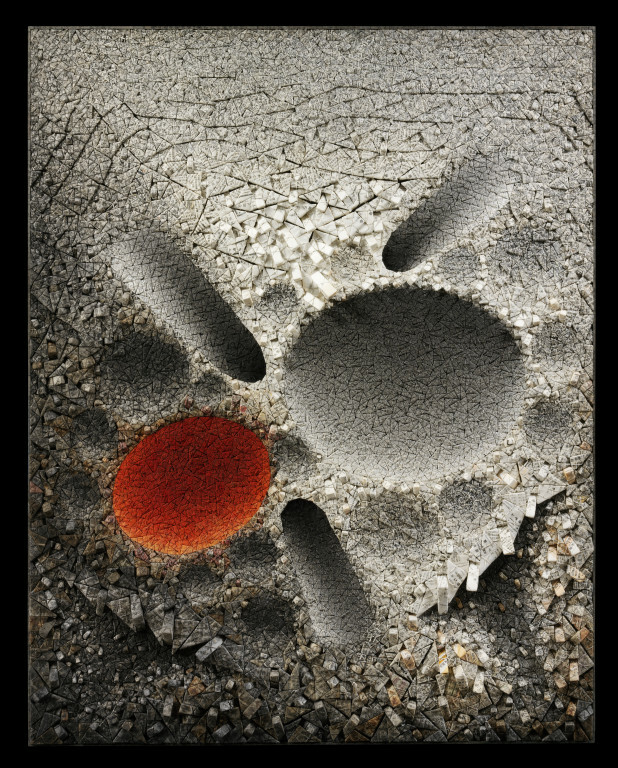 "Shin Dansai (Altered)" (cropped and logo superimposed) by Charles Shahar is licensed under CC by 2.0.